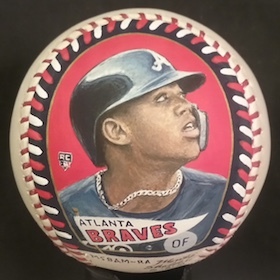 New to the hobby scene, 2019 Piece of the Game Authenticated Masterpieces Baseball is a super-premium release that features only game-used and signed baseballs that are also hand-painted with an image of the player. The very limited production consists of just 15 numbered boxes with 10 balls per box. The boxes are issued in a blind format, like sports cards, so every baseball is kept under wraps until opened. 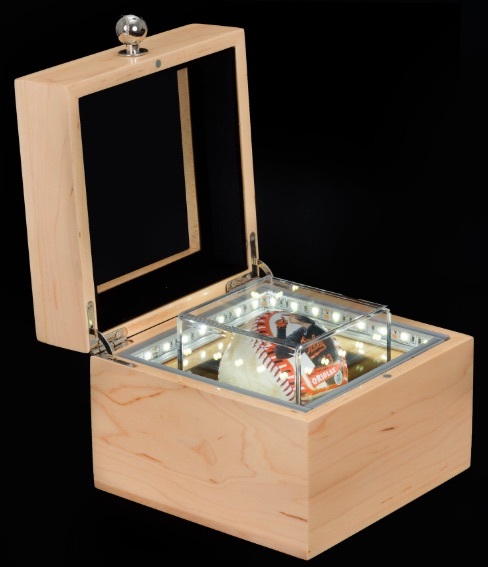 On top of that, boxes are hand-made from maple and ash wood and utilize LED lighting. As a very high-end product created for group breakers, all the baseballs in 2019 Piece of the Game Authenticated Masterpieces are one-of-one collectibles. The artwork is supplied by Monty Sheldon, a very well-known name in the collecting world. 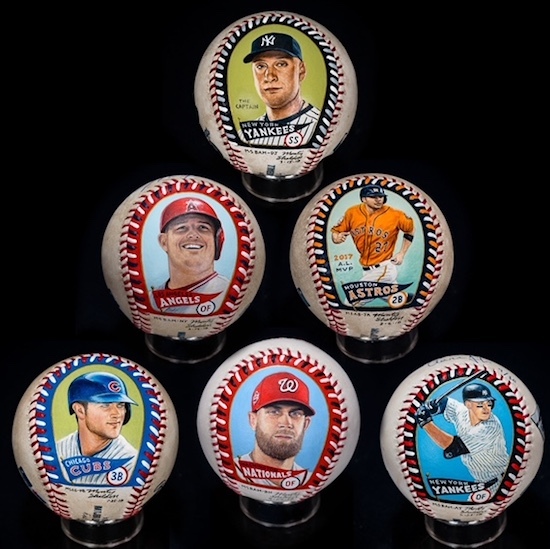 Sheldon also contributed painted baseballs to 2017 Topps Transcendent Collection Baseball. 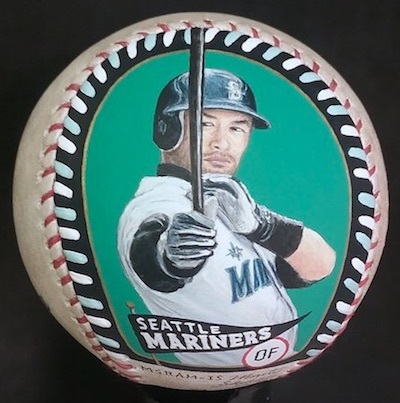 Of course, the detailed player images are not the only element in play, as every ball is also game-used with MLB certification. And finally, every ball is autographed by the player in question. These signatures are authenticated by Beckett, Fanatics, JSA, MLB, PSA/DNA or Steiner. 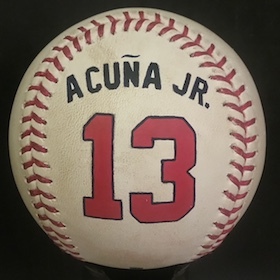 Every baseball also comes with online access to the comprehensive"Baseball Identity" breakdown, which supplies full details about the origin of the game-used ball, including the full stats and any footage of the actual ball in play. 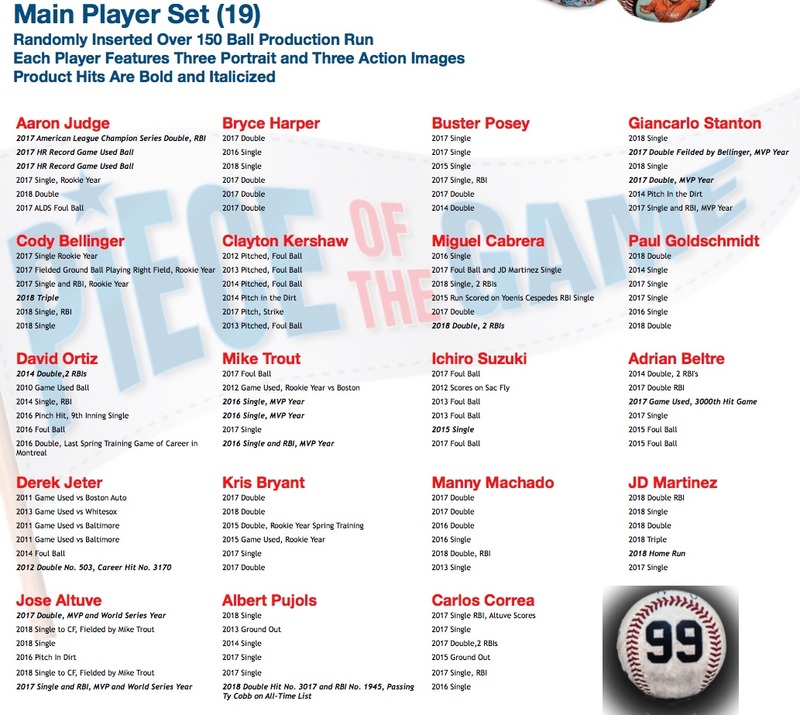 The main lineup in the 2019 Piece of the Game Authenticated Masterpieces Baseball checklist includes 19 players. All players have three portrait images and three action images, for a total of six different baseballs per subject. In addition, seven of the top 2018 Rookies are more limited with only three balls per player. The rarest hits are the 14 different one-of-one Dual options mostly featuring key teammate pairings. These average just one per box. Supplying the ultimate chase is the one-of-one Babe Ruth sweet spot autograph ball (JSA authenticated). This is the only ball in the product without game-used MLB authentication. 150 one-of-one baseballs in total. Includes 19 main players (6 baseballs each), 7 rookies (3 baseballs each), 14 dual player and 1 Babe Ruth ball. 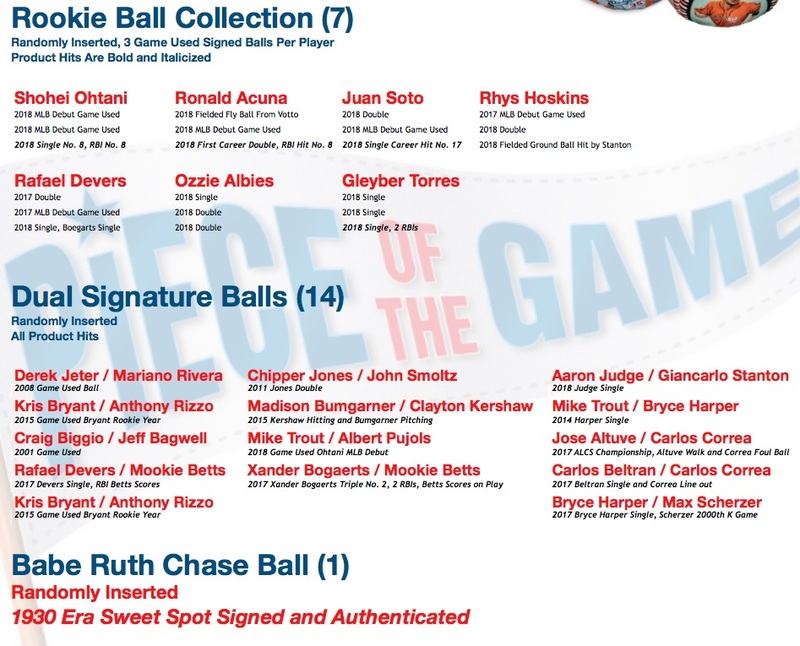 Click the image to see the full list of game-used balls for each player. Never seen anything like it. Very impressed. Unreal detail Money Sheldon is incredible. Any idea what a single box (ball) cost will be??? I believe MSRP is $3,600 per ball. Something new these are crazy cool! Every ball is 1/1? Yep. All baseballs are one-of-one editions. Have these hit the market? What did a single box of 10 balls go for? I never saw them for sell anywhere? And I have never seen a single ball for sell? The release date keeps getting pushed back. The 10-ball box sells for $36,000. 2018 Topps Chrome Sapphire - 1 HOBBY BOX with 3 AUTOGRAPHS, Online Exclusive!